Between Dr. Octagon, Deltron 3030, Lovage, and Handsome Boy Modeling School, Dan the Automator has a pretty long track record of one-off collaborative projects, so when he and Damon Albarn of Blur released their first album as the “virtual group” experiment called Gorillaz in 2001, longevity was the last thing on anyone’s mind. But their lead single “Clint Eastwood” became an unlikely hit, and 9 years, 2 albums, and over 15 million units sold later, the Automator may be long gone but Gorillaz is a household name and Albarn is as well known for it as he is for Blur. 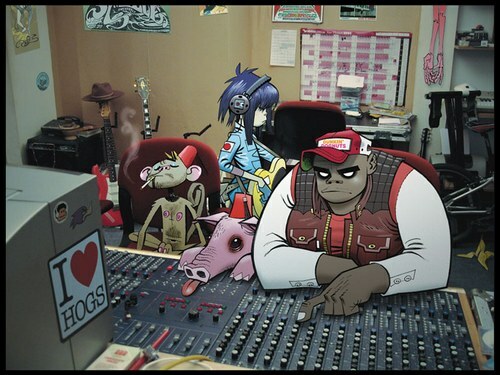 With hit singles featuring outside artists like Del tha Funkee Homosapien, De La Soul, and Shaun Ryder, Gorillaz has always been as much a vehicle for guest stars as it has been an actual group. Consequently, a Gorillaz “album” can often seem more like a compilation, which is a shame since the tracks that more prominently feature Albarn’s vocals have always been among my favorites. Their newest album Plastic Beach and its lead single “Stylo,” featuring Mos Def, Bobby Womack, and a music video starring Bruce Willis, continue this practice, but the album also features a couple of Gorillaz “solo” tracks, and “Rhinestone Eyes” is my pick of the litter.